A bit of a misleading title as the bulk of "the history of" is contained in the first two chapters on antiquity and Christianity. Most of the remainder of the collection are reprints of articles and book reviews originally appearing in The Quarterly Review, The English Historical Review, The Nineteenth Century, The Rambler, The Home and Foreign Review, The North British Review, The Bridgnorth Journal. Two essays of particular interest, though really only peripherally attached to "freedom," are the history of the Saint Bartholomew's Day Massacre (in which as many as 30,000 French Huguenots were slaughtered in several weeks of mob rioting in 1572) and an insiders history of the events leading up to and during the first Vatican Council of 1868 (in which Papal Infallibility was recognized. Personally, it was a very revealing insight that shows that all of the maneuvering and scheming and dirty-dealing that went on behind the scenes during the Second Vatican Council in 1962 was nothing new).The book reviews are rather dry and incomplete (and this is the reason for the 4 star rating) unless you've already read the books or are thoroughly familiar with the contemporary history surrounding the author and his circles (speaking German, French, and Latin helps also). And trust me, no matter how familiar you might think you may be with it all, Lord Acton is infinitely more familiar. His simple mastery of EVERYTHING makes you feel like a perpetual community college student because you will NEVER reach his level of wisdom. Acton comes from a time when, yes, contrary to the high esteem in which we regard ourselves today, there were once men who knew better than you. He was one of them. 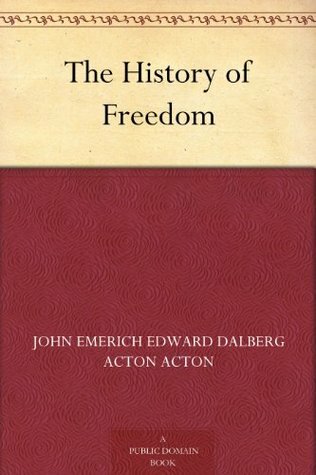 John Emerich Edward Dalberg-Acton - John Emerich Edward Dalberg-Acton, 1st Baron Acton, and usually referred to simply as Lord Acton, was an English historian.